If You’re Lucky, You Have One. A Tiny Shoppe Round the Corner that is Filled with Special Treasures. Not the Big Box, Big Chain, Big Anything Place. Rather, a Magical Spot for Granting Wishes. There is such a shoppe round my corner….Willow. Even the Name is Wispy and Soft and Small. I went in for a quick spin with my cousin. We’ve been shopping together for, well, ever. She Found Willow First. I followed. I just wanted to share with you a special place that is warm and inviting and fun. When I Shop, What draws me in first is Color, then the Feel of the Fabric. Luscious Fabrics. Exquisite Colors. Interesting Styles. Great Fit. Cottons. Velvets. Wools. Leather. Fur. And Oh My…We bought the Same Top. Same Color. Same Fabric. Same Top. Kind of Like Junior High School. Girls Again. Oooing and Ahhing. Willow – Fine & Fun Women’s Fashions & Accessories. Do You have a Shoppe Round Your Corner? We have a great many of them here near Ogden/Salt Lake. 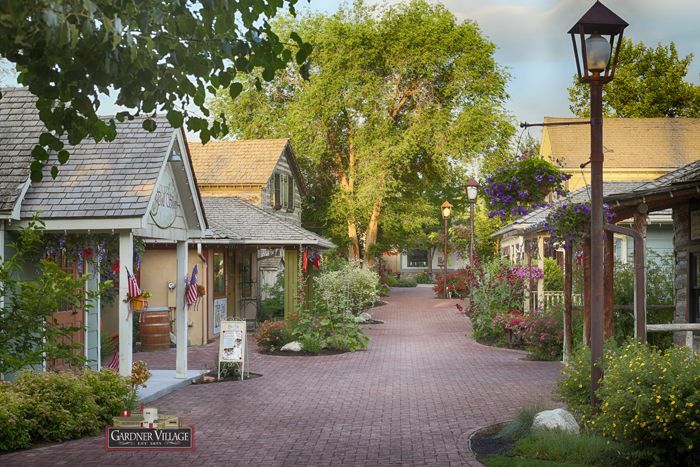 In fact, a WHOLE village of them called Gardner Village. It used to be a grain mill and is a collection of all the little houses where the polygamist kept his wives! It’s got a great restaurant. Love going down there with the girls. I seldom buy a lot, but I love those green shoes in the picture up above! Another fun post Jeanne! Yes we do like to shop and I think Willow is my next favorite store when I come to Albuquerque. Looking forward to wear my velvet top tonight at a Christmas dinner. This post brought back a memory I have when we were in high school. Do you remember when we went to Talbots in Cold Spring Harbor? All I could afford was a pair of socks. ? I love special stores like that. And I have to say, there ARE no little shops like that in the town where I live. That’s why I loved living in NYC–there were no malls. Just tons of small stores and I miss shopping like that!!! I love this post!!! Hi Catherine – These shops are few and far between here, but there are some here. I miss Brooklyn for the same reason…in fact, during law school, the owner of a little neighborhood boutique (who knew me by name!) asked if I would like to work for her while I went to school…Yes!! It was a good break for me…I loved all the fun new things, I had a key to the shop and got a discount too! Good Times! Oh, I love those colorful things at the top, whatever they are. And that soap! Looks luscious! I do have a shoppe around the corner and I love to pop in. I never know what I’ll find and it carries stuff that’s different (and better) than a chain store. Hi Katy – So glad to meet you…shopping that is different and close…perfect together…thanks so much for visiting! Ah too bad we don’t have a willow store here in UK. However love the cheerfulness behind your post. You sure sound like you had fun. Hi Simply-Me. Yes, it was fun…just two cousins laughing and remembering.